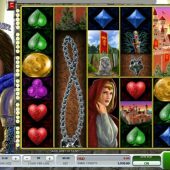 Wolfheart slot is an innovative game from 2by2 Gaming. With polished HD graphics and a format that you probably won't have seen before - promising start! Upon first glance it looks like a 5-reel 6-row slot but appearances can be deceptive - it is in fact 2x 6-row reels next to 3x 2 3-row reels, giving 8 separate reels in the game. Wolfheart and his female friend form the highest-paying symbols and naturally they are stacked according to the reel rows, either single, 6-high or 3-high. The Wolfheart symbol is a stacked Wild with no multiplier, but who needs multipliers on a medieval-themed game with 60 pay lines? The Wilds pay 50x stake for 5-of-a-kind and the highest symbol pays 12.5x stake for the same. Despite 60 pay lines the stake is only 40 coins and there is a respectable RTP of 96.03% for the player. The soundtrack has the appropriate mandolin medieval sounds too. 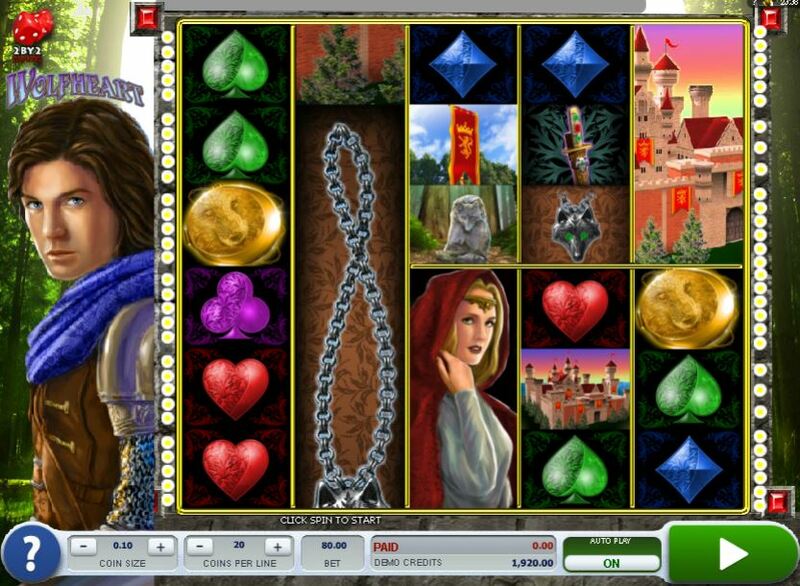 Wolfheart slot has a decent bonus round as there are gold coin scatters on each of the 8 reels. You require 3 or more, and get 8 free games for 3 right up to 60 free games should you land all 8 which also awards 100x stake! The enhancement is that not only Wolfheart himself is a Wild, but his female counterpart is too: they become the Black Wolf and White Wolf respectively and they also double the win should they form part of any wins in the free games. Retriggers are available and there is also another extra spin awarded should you get only 2 scatters, a feature that is always good to see in a bonus round.